Some say it’s all in my head. Musculoskeletal disorders are conditions affecting the bones, muscles, and connective tissues. The most common symptom of most musculoskeletal disorders is pain. According to the 2016 Global Burden of Diseases, Injuries, and Risk Factors Study, the most common leading cause of disability for men was low back pain “resulting in the highest age-standardised rates of years lived with disability (YLDs) in 133 of 195 countries and territories, including every country in the high-income regions, central and eastern Europe, central Asia, Andean and Tropical Latin America, and eastern and central sub-Saharan Africa, as well as most countries in southeast Asia, north Africa and the Middle East, and western sub-Saharan Africa. Low back pain was the leading cause of age-standardised YLD rates for women in 104 of the 195 countries and territories.” Neck pain and other musculoskeletal disorders ranked in the top ten of more than half of the countries and territories. Half of all American adults (126.6 million of U.S. adults over the age of 18) reported being diagnosed with musculoskeletal conditions in 2012 according to the Executive Summary of The Burden of Musculoskeletal Diseases in the United States: Prevalence, Societal and Economic Cost” by the USA Bone & Joint Initiative. “Thyroid hormones play an important role in the development, maturation and maintenance of morpho-functional integrity of locomotor system structures,” wrote a researcher in the Romanian Journal of Rheumatology. The relationship between hypothyroidism and musculoskeletal conditions has appeared in the scientific literature since the 1800s. Shoulder pain and its relationship with thyroid disorders has been suspected since the late 1920s. More recently, the implication of thyroid disease in rotator cuff tendon tears has been studied. The neck stiffness and joint pain associated with hypothyroidism have been known for centuries. In 2016, 52 rheumatoid arthritis patients underwent thyroid function testing and 20 of the 52 patients (38.4%) had hypothyroidism. Adhesive capsulitis (frozen shoulder), Dupuytren’s contracture, trigger finger, and limited joint mobility are common in patients with hypothyroidism as well. The prevalence of fibromyalgia is approximately 2-7% in the general global population but as high as 30-40% in the population with the thyroid autoimmune disease Hashimto’s thyroiditis. Based on a study which analyzed data from individuals who participated in health screening programs at Chang Gung Memorial Hospital in northern Taiwan (2000–2010), both hypothyroidism and hyperthyroidism were significantly associated with gout. Tendinitis is another common painful presenting complaint in hypothyroidism. The Journal of Medical Case Reports includes the unusual (or maybe not so unusual) case of spontanous rupture of the long head of the biceps tendon in a 48-year-old woman with severe hypothyroidism. The relationship between hypothyroidism and musculoskeletal disorders is significant. Comprehensive thyroid testing including thyroid antibodies should be part of the workup of a patient presenting with musculoskeletal conditions. 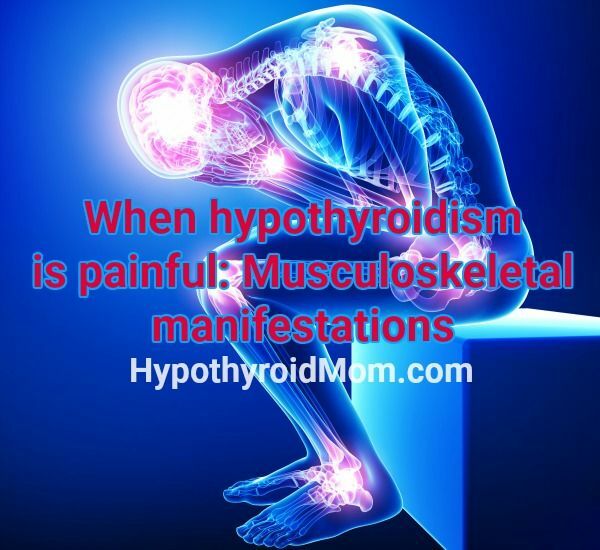 Musculoskeletal manifestations can serve as early signs of undiagnosed hypothyroidism and warning signs of hypothyroidism that is not optimally treated. Psssst! Your pain is NOT in your head. 1. GBD 2016 Disease and Injury Incidence and Prevalence Collaborators. Global, regional, and national incidence, prevalence, and years lived with disability for 328 diseases and injuries for 195 countries, 1990-2016: a systematic analysis for the Global Burden of Disease Study 2016. The Lancet. 16 September 2017;390(10100):1211-1259. 3. Parasca, I. Manifestari reumatologice in bolile tiroidei. EMCB. 01.07.2008. 4. Radu, I., et al. Musculoskeletal Impairment in Primary Hypothyroidism. Rev Med Chir Soc Med Nat Iasi. 2016;120(2):244-251. 5. Oliva, F., et al. Thyroid hormones enhance growth and counteract apoptosis in human tenocytes isolated from rotator cuff tendons. Cell Death Dis. 313;4(7):705. 6. Doyle, L. Myxoedema: some early reports and contributions by British authors, 1873-1898. J R Soc Med. 1991;84(2):103-106. 7. Joshi, R., et al. Prevalence of hypothyroidism in rheumatoid arthritis and its correlation with disease activity. Sage Journals. 20 Jan 2016;47(1):2017. 8. Eslamian, F., et al. Electrophysiologic Changes in Patients with Untreated Primary Hypothyroidism. Journal of Clinical Neurophysiology. June 2011;28(3):323-328. 9. Cakir, M., et al. Musculoskeletal manifestations in patients with thyroid disease. Clinical Endocrinology. Sep 2003;59(2):162-7. 10. Haliloglu S, et al. Clinical Rheumatology. July 2017;36(7):1617-1621. 11. See, L.C., et al. Hyperthyroid and hypothyroid status was strongly association with Gout and Weakly Associated with Hyperuricaemia. PLoS One. 2014;9(12):e114579. 12. Pantazis, K., et al. Spontaneous rupture of the long head of the biceps tendon in a woman with hypothyroidism: a case report. Journal of Medical Case Reports. 2016;10:2. 13. Alakes, K.K., et al. Rheumatic manifestations in primary hypothyroidism. Indian Journal of Rheumatology. March 2013;8(1):8-13. I’ve had a thyroid condition for 30+years, 3 years ago was diagnosed with fibromyalgia. I’ve been on Synthroid for years I go every 6 mos for blood work to have my levels checked always comes back normal. My body is always in pain lower/upper bacl/back pain. Arthritis on my spine, bone spurs and some buldging disks. Arthritis in both hands plus carpal tunnel… and because of this darn pinch nerve that I have in my neck I guess it’s causing my migraines. I’ve tried traction for my neck but that was too painful. I’ve also tried different meds for migraines and pain none seem to work. I’m at a loss. Hi I have suffered with underactive thyroid for 28 years I’m a very active person and have mostly been OK ,the last 18 months I’ve had severe pain in my knees,shoulders, ankles,fingers, feet and back. My doctor just tells me it’s arthritis I think due to the amount of avtivity I do. I’m not convinced this is so I’m due for my twelve monthly thyroid check up so what should I ask to be check in my blood test.? I have many of the symptoms listed, including surgery on both hands for carpal tunnel. Severe neck pain since I was in my 30’s (I’m 62 now). My thyroid was removed due to a benign tumor. When I bring up the issue of Hashimotos or anything related to the thyroid I’m told since it was removed and I’m on thyroid medicine now it’s like I have a normal fully functioning thyroid. Although I don’t know how my doctor knows this since I don’t know when the last time he checked it was. It’s like they just don’t believe there could still be a problem. It’s so frustrating but I appreciate your letting us vent about it. Thank you! Hi Becky, Since Hashimoto’s is an autoimmune disease, removal of the thyroid gland doesn’t eliminate the fact that the immune system mistakenly attacked a body part and can continue to do so with other parts of the body. Which explains why often times a person with one autoimmune disease has multiple autoimmune diseases over time. Also, it may be that you are not optimally treated, which is so important if you’ve had your thyroid removed. Here is information about the various thyroid medication options that you should know about. Omg..I have been dealing with thigh/ hip pain..ortho says arthritis..going to great chiropractor, my rt3 is high as are my antibodies. I thought I was on optimal t3 but now not sure. oh wow Yvonne I can’t imagine all you’ve been through with such high TSH levels. Please know there is hope to be well with hypothyroidism. I wonder if your fluctuations in thyroxine are due to rising and falling TSH levels? I ask because the number one cause of hypothyroidism is the thyroid autoimmune disease Hashimoto’s, which can come with swings up and down and back up again in thyroid lab levels. Here is an article with thyroid lab tests to have run and the optimal ranges so that you can check your results. Thyroxine contains T4 thyroid hormone only and as you’ll read in this article those types of medications don’t work for us all. Wow.. What an eye opener. I was having an annual physical in 2002, and based on TSH levels, I was told I had Hypothyroidism. I went to an endocrinologist, and he found a nodule in my thyroid. I was prescribed levothyroxine, and have taken it since then until recently switching to Synthroid. I never felt any different after starting this medication years ago, because I didn’t know how I felt was tied to thyroid issues. I always thought, how I feel, is just how I am… I am experiencing a high multitude of symptoms still. Time for a change. Thank you for all the info. Hi. I was actually diagnosed with Hashimoto’s about 7-8 months ago. The doctor that I went to gave me that diagnosis, but didn’t prescribe me anything for thyroid at all. Instead, it’s a “female” clinic kind of thing, and they wanted me to have a “pellet” type medication inserted under my skin. (Hormones) Still yet, NOTHING to do with thyroid. I said no, of course. So, they put me on a a prescription for Progesterine, which didn’t really help anything at all. So, after that I started developing such awful knee pain, I was directed to an orthopedic doctor. He gave me shots, some medication, and said you have Osteoarthritis. I’m telling you, my knees hurt so bad, I couldn’t even raise up out of a chair right it hurt so bad! Walking every day was the worst pain in my life. Medication didn’t help much, and here I am…about 12 months down the line now, and STILL nothing for thyroid! Still have horrible knee issues. Now starting to have shoulder and hand joint issues. I have every single classic symptom: dry skin, weight gain, awful hair, sore hands, sore knees, mental fog, intolerance to cold…all of it! My only hope is I have an appointment with a new doctor tomorrow, and I am praying that she knows what she is doing! I am about on my last limb here, and my whole life has gone to crap!! I can’t find a doctor who will help in the right ways. I need relief! And a doctor with a some common sense. I’m only just now finding out, through life experience, what an impact hypothyroidism has on joint and connective tissue pain. My lab work has revealed that I do not have Hashimotos, do not have Grave’s. I have an inherited predisposition to poor T4-to-T3 conversion. Before starting on T3 meds, I had such bad pain and stiffness in my feet, ankles, knees, sometimes both shoulders and elbows; and a thumb joint! After starting on 30mcg of T3 daily, I was startled at how good it felt to be in substantially less pain!! I would say, the pain has reduced by maybe 80%! And it took less than 10 days to feel the difference!